An impressive centre situated in a central location, providing a range of furnished office-space solutions available to let on flexible terms. Here, tenants can make use of the high-speed internet access, meeting rooms, conferencing suites, reception desk and 24-hour access. In addition, the surrounding areas are filled with local amenities including restaurants, bars and hotels. Transport links are substantial as well, providing convenient travel around Amstelveen and Amsterdam central. With an impressive glass exterior, you will occupy an impressive space with an equally prestigious interior. The offices, breakout lounges and kitchens come fully equipped, and your memberships will give you access to a range of well-designed communal spaces. The centre is accessible 24/7, and you can find hotels, restaurants and many shops close by in addition to an abundance of attractions such as theatres. This is the perfect workspace in which companies of any background can flourish! 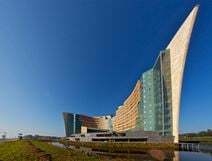 Just 10 minutes from Schiphol Airport this distinctive building provides a natural and green environment to work from in a choice of fully furnished and serviced offices and meeting rooms. There is also a support team to ensure your operations run as efficiently as possible. Close by, there are many restaurants, cafes and terraces, as well as museums and historical monuments. 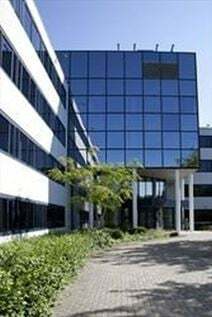 Offering fully furnished office space in the north of Amstelveen this business centre offers a range of work spaces including hot desks, private offices and meeting rooms of various sizes. The building also boasts a fully equipped kitchen, on-site restaurant and private garden area. IT support is provided onsite to tenants and reception serviced by a professional team of staff. Parking is available for your convenience and you are only minutes away from public transport links. Found in an ideal location for you and your business, this centre offers modern and contemporary office spaces at an affordable rate. The centre provides flexible terms, allowing you to stay for however long you'd like. With access to fully equipped work spaces and a drop-in business lounge this is a great place to work on the go. You will have 24 hour access to the building with convenient car parking and bicycle storage options. The centre is right beside a shopping mall offering over 200 restaurants and retailers. Recently refurbished to a high standard and decorated with great attention to details, this modern building consists of elegant office spaces. These offices are provided with high speed internet connection, technologically equipped meeting/conference rooms, spacious lounge area and reception area managed by a highly professional and qualified staff. Surrounded by shops, restaurants and numerous amenities, this building is easily accessible and well connected. An impressive centre situated in Amstelveen, providing furnished offices at affordable rates. Office spaces are available on flexible terms and benefit from super fast internet connection, air-conditioning, 24-hour access and a luxurious business lounge. A reception service is also provided on-site, ensuring that administrative duties are handled responsibly. In addition, the surrounding areas are easily accessible via road, train and metro connections. Amsterdam and Schipol are extremely proximate as well, which provide an abundance of local amenities to enjoy outside of the office. 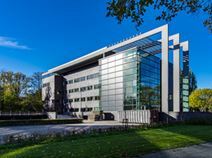 Offering a great range of different sized work spaces, this modern building is situated just outside of the city centre of Amstelveen. The building has co-working spaces, private offices, meeting rooms and video conferencing facilities. Your membership includes access to a great range of communal spaces including break lounges and kitchen facilities. The building boasts a beautiful reception area on the ground floor and fantastic views of the city from the office.